“Christmas at the Davenports’ house was always about one thing: food! But when sisters Ella and Maddy were split up, Ella to live in London with their Dad, and Maddy staying in Greece with their Mum, mince pies lost their magic. Now, a cheating husband has thrown Ella a curved snowball…and for the first time in years, all she wants is her mum. So she heads back to Greece, where her family’s taverna holds all the promise of home. Meanwhile, waitress Maddy’s dreams of a white Christmas lead her back to London…and her Dad. It’s basically a festive Mamma Mia / Bridget Jones hybrid (although none of the main characters are as annoying as BJ!) It alternates in location between Greece and London with intertwining stories of 2 sisters. The points of reference were bang on for me – I particularly loved the Sweet Valley High reference (I always wanted to be Jessica although was way more Elizabeth – but in my case Elisabeth!!) and TV viewing references to Strictly / XFactor / The Voice – it just all felt totally relevant to me and I loved that! Now my friends know I am a bit (ok, a lot!) of a pedant – and I noticed a couple of typos – which always makes me cringe a bit – but it didn’t detract from the lovely story. This is not a highbrow book – but is a perfect easy read, and even got me – self proclaimed grinch – into the festive spirit! 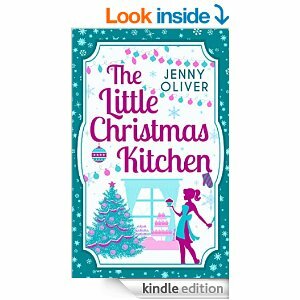 I have already downloaded Jenny Oliver’s other books to read which shows that I enjoyed it. I’d also love to know what happens to the characters next……..